Frank Lloyd Wright, Hollyhock House, 1921, Los Angeles. Photo: Joshua White. 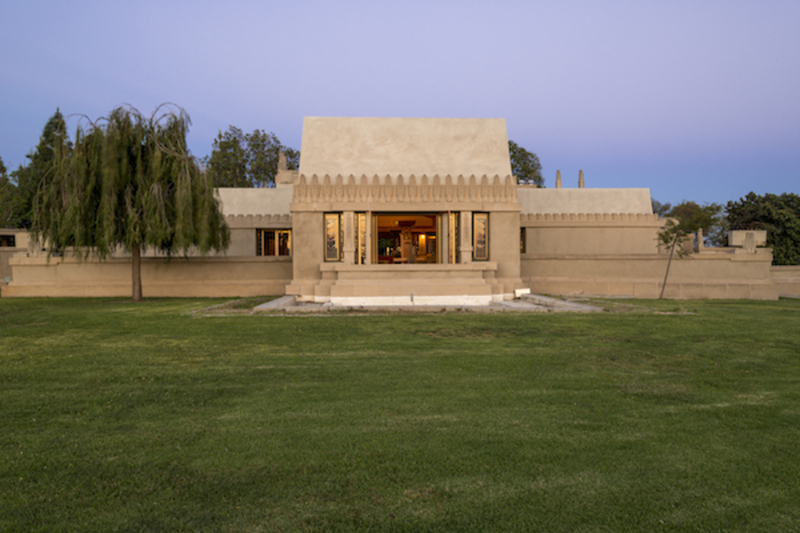 FRANK LLOYD WRIGHT’S 1921 Hollyhock House, a temple-like home on top of Los Angeles’s Olive Hill, marks not only a sharp divergence from the architect’s previous Prairie School period but the starting point of all that came after it. Wright’s first foray onto the sun-soaked LA landscape and the radical leanings of the client, Aline Barnsdall—oil heiress, anarchist sympathizer, single mother by choice—synthesized into an experimental architectural program. Wherever possible glass doors, rooftop terraces, and outdoor counterparts to indoor spaces join the building to the open air of the site itself, introducing Japanese concepts of uniting interior and exterior, which were to become a future hallmark of airy California modernism. Early inklings of Mayan Revival show in references to Pre-Columbian architecture, including the ornamented clay tile façade; canted walls and flat mansard roofs; and forebodingly tomb-like entrance. Hollyhock house curator Jeffrey Herr describes the multilevel floorplan as a series of “deviations from normal domestic needs” that implicitly made way for the California Ranch-Style house. In its beguiling idiosyncrasy, the Hollyhock House was meant to indulge Barnsdall’s flair for the dramatic. She had envisioned it as her on-site residence within a thirty-six-acre theater complex devoted to the avant-garde, which she pictured as having dormitories for traveling actors, studios, a theater, and a cinema. None of that was ever realized. She fired Wright mid-construction in 1921, due to disputes over cost and his infamous ego. Eventually, she abandoned the project herself, gifting her home (ultimately completed by a young Rudolf Schindler) and its surrounding eleven acres to the city in 1927. In the decades to follow, the house changed hands between local art societies, was left vacant for several years in the 1940s, went through not one, but two haphazard renovations, and was then converted to a house-museum in the 1970s, a shell of its former self. In 2012, realizing the folly of its ways, the city shut Hollyhock house down with the intentions of starting anew. Before the house reopened as a public museum in February, it underwent the third major intervention of its ninety-four-year history, a multiyear renovation at a cost of over four million dollars, intended to revive Wright’s original architecture. There were leaks to fix, drains to unclog, and water damage to repair. (“Water has always been the enemy of this house,” Herr says; Hollyhock, like many of Wright’s innovative structures, suffered from the practical limitation of a leaky roof.) 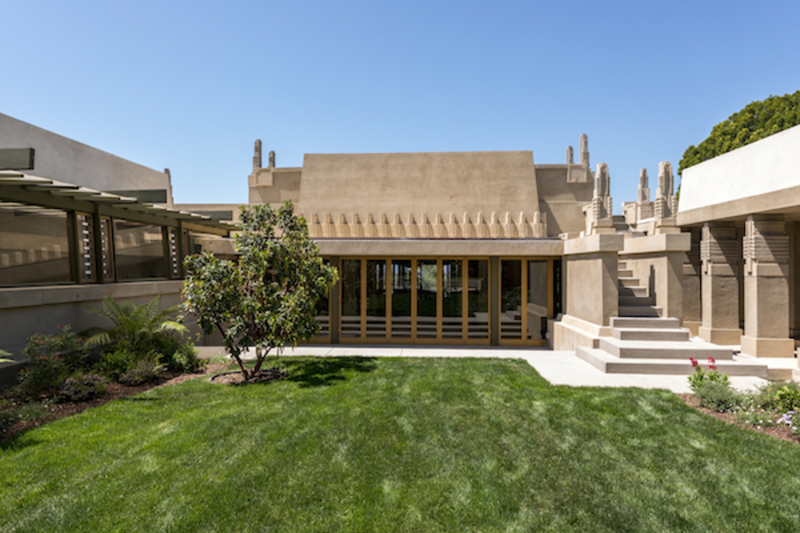 But ironically much of the restoration process was undoing the well-intentioned renovation work of Wright’s son Lloyd Wright, executed before the advent of any proper architectural preservationist standards. In 1946, the younger Wright “fixed” the leaks in the roof over the porch by simply removing it. During another restoration in 1974, he reinstated the roof, but followed the unfortunate stylistic standards of the decade: He installed recessed square lights in the ceiling, replaced the accordion doors with sliding ones, and stripped the moldings from the walls. The color palate was even worse. “Everything was beige,” Herr laments. Painstaking is the mot juste to describe the efforts to revive Wright’s original and meticulously choreographed details, the attention to minutiae necessary to achieve, in Herr’s words, “authenticity to the highest degree.” He and his team studied a collection of Barnsdall’s own photographs as points of reference to undo Lloyd Wright’s alterations. They removed his additions to the porch, recreating the look of the original floor, plaster walls, doors, and installing authentic 1920s hardware. As work progressed, new clues would emerge. Ancient construction detritus that workmen from the ’40s had tossed into a planter revealed the original colors of the walls, which were summarily unbeiged. They were repainted the original warm, forest green overlaid with a sheer layer of shimmery mica, resulting in an heiress-grade lushness that plays with the light as it travels through the spaces. In the dining room, the discovery that the clerestory art-glass windows were actually longer than their frames revealed that Lloyd Wright had raised the ceiling by a few inches; the team then lowered it to its original height. 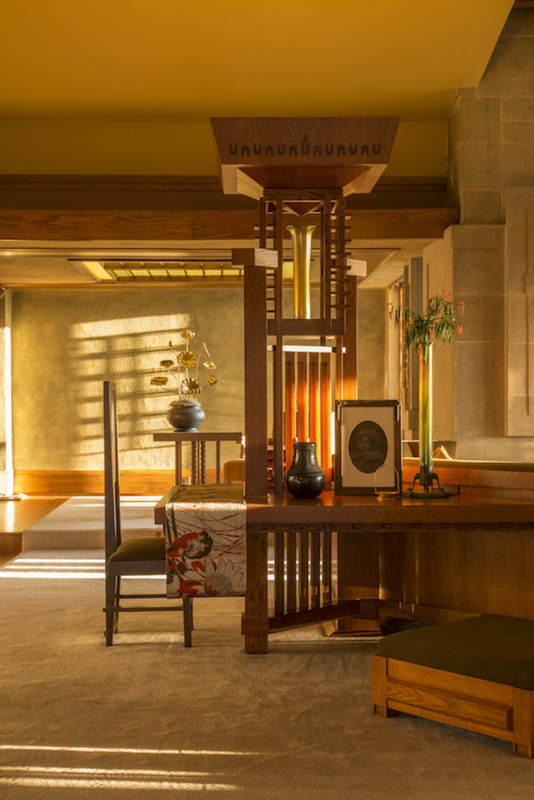 At the heart of the Hollyhock House, the living room has returned to its past sumptuousness, furnished with reproductions based on Barnsdall’s ’20s photographs. Those in turn relay Wright’s preoccupation with Japanese culture; at that moment his dealing of Japanese art was more profitable than his architecture, and he had spent much of this period overseeing his only other concurrent project, the Imperial Hotel in Tokyo. (His frequent absence, in addition to his inflated ego, built up to his dismissal.) The Japanese influence is apparent in the décor’s seventeenth-century paper screens and pagoda-like lamps, and a dissolution of barriers to nature. Generous amounts of light permeate the space, thanks to the procession of French doors that run through the central axis, allowing one to actually stand at the fountain in the backyard and look through the house onto the Hollywood Hills. The mood in the room is palpably Wrightian in its reverence to nature and recurring geometric motifs. The latter, too, were borrowed from a Japanese tradition, which the architect admired for its elimination of the extraneous. Wright took Barnsdall’s favorite flower, the namesake Hollyhock, and reduced its stems and bulbs to geometric abstraction. The motif repeats in many forms, from the reliefs of the facade to the patterns on the plush reproduction of the rug to the spines running up the seatbacks of the dining room chairs. The original Wright sofas were reproduced and resituated according to early photos, not facing each other as to facilitate conversation, but angled to face the same direction as in a theater. 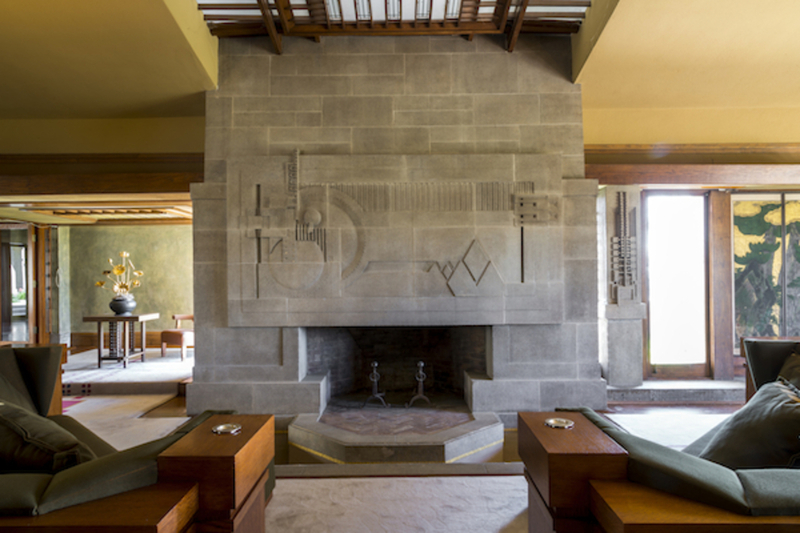 Rather than a stage, guests would focus their gaze on Wright’s artwork: a bas-relief of cast-concrete geometric shapes mortared together in a modernist landscape, where the four elements would converge. Above, Wright installed a skylight, below was the fireplace, and before it, a now-empty pool of water. There are, of course, limitations in resurrecting the past. To protect the house from the havoc wreaked by humidity, the pool will always be empty. And amid the house’s return to its former self, there were rooms that had to go without. Lacking the necessary visual references to the original, the team restored the kitchen from its ’70s Lloyd Wright incarnation back to that of his intervention in the ’40s, which the earliest available photographs depict. (The process mainly involved replacing the formica counters with mahogany.) Elsewhere on the ground floor, two similarly forgotten bedrooms now provide gallery space for wooden maquettes of Barnsdall’s dream complex. The second floor, largely Schindler’s work, is closed off to the public for inaccessibility to the disabled. The rooms that have been restored, however, are accurate to the minutest detail. In tandem with the grandiose gestures of the building as a whole, the sum of these small parts embody the profound exchange between Wright’s architecture and the urban landscape of California, an encounter that transformed the future trajectory of both. While there are material, physical markers of authenticity that have been lost to time and wear and will never be recovered, they are of less consequence than fidelity to Wright’s vision and ideas, the legacy of which will outlive and out-influence a leaking roof. Janelle Zara is a design and architecture writer based in Los Angeles.